SINGAPORE (AP) — With the Singapore street circuit suited to Ferrari, Sebastian Vettel is hoping to reclaim the Formula One championship lead from Lewis Hamilton this weekend. Vettel secured six straight podiums on Singapore’s floodlit Marina Bay street circuit until his run ended with a fifth place last year. No driver has had more podium finishes in Singapore than Vettel, whose impressive streak at the night race includes three straight wins from 2011-13 during his run of four straight F1 titles with former team Red Bull. The 5-kilometer (3.1-mile) circuit resembles the Monaco GP in terms of its sinewy layout: A low-speed, hard-braking track favoring maximum downforce and reducing the outright pace of Hamilton’s Mercedes. 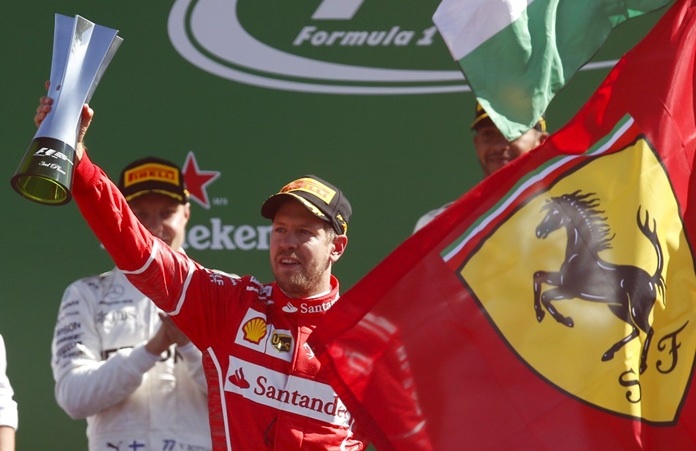 Vettel’s confidence will be further boosted by the fact he comfortably won Monaco this year, with Ferrari securing a 1-2 finish and Hamilton in seventh place. Ferrari also clinched 1-2 in Hungary, another track which neutralizes the power of Mercedes. The last two races of this season, in Belgium and Italy, were more suited to Mercedes and played to Hamilton’s strengths. And he won them to move three points ahead of Vettel in a thrilling title contest. There are six races remaining after Singapore, a circuit which has caused problems for Mercedes before. When Vettel won here in 2015 — in his first season with Ferrari — Mercedes stuttered as Nico Rosberg placed fourth and Hamilton retired with engine failure. Although Hamilton won here in 2014, he finished only fifth the previous year, and retired two further times with his previous team McLaren. There are few places to overtake in Singapore, but one of those is the blistering run into Turn 7. Drivers must get the timing just right as they approach at a top speed of 320 kilometers (198 miles) per hour before braking heavily down to 120 kph (74 mph). Such a tough corner invariably puts drivers under strain, and Hamilton sustained a puncture and retired after bumping tires with Red Bull’s Mark Webber in 2010. Drivers must also contend with sweltering humidity, as Red Bull’s Daniel Ricciardo explains. Ricciardo arrives in Singapore in very consistent form, with six podiums in the last nine races. After a tough start, punctuated by two retirements in four races, he is hitting peak form. The Australian driver is growing in stature and arguably has credentials of a future champion, particularly in turning difficult situations around. In recent weeks, he has demonstrated the full repertoire of his driving skills: brilliantly cutting through the field to finish fourth in Monza two weeks ago, and making an astutely opportunist overtaking move in Spa the race before. His uncanny ability to sense an overtaking move is among the best, and he feels he has a good chance to challenge for a victory.